Madrid is Spain’s capital and the largest city in the country. It offers a very different experience to the sunny resorts and touristy establishments on the southern coast, as the city sits right in the heart of the country. 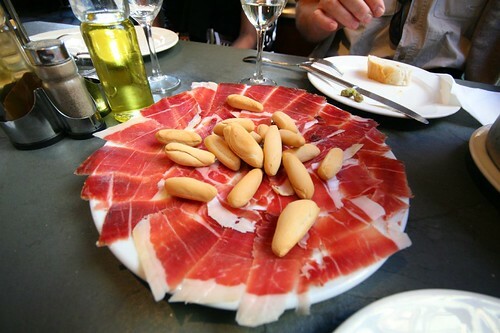 Karen has shared with us ideas on things to do in Madrid, but what if you’re here for the food? Yes, tapas are high on many tourists’ lists because the pundits say Madrid has the best in the country; while I personally think it’s a toss-up between Madrid and San Sebastian, you certainly won’t go hungry in Madrid. But how to get through an evening of tapas tasting without breaking your budget? Here are some of my top tips. Your eyes are hungrier than your stomach. It is more than ok to order just one or two tapas dishes, and then order more after you’re done. While in Madrid, I saw a lot of foreigners order so many things their table didn’t have room. Don’t do that. Just order a couple of things, and see how you get on. This also allows you to bar hop and try the specialities of a few different places. Always go for the tapas – and ask about specials. You’re here for tapas, so skip the entrées – the tapas are a lot cheaper and you can fill up on simple things like meats and cheese – and often extras arrive like nuts and breads. Do ask your server what the specials are, as you’ll find sometimes there is a deal to be had. The booze adds up – but you knew that already. It goes without saying that the drinks can add up to the bar tab awfully fast. It’s hard considering that the house wine can be pretty cheap, at least compared to your local, but 3 or 4 glasses later, your pockets can start feeling a bit empty. Plan your parade route. Half joking on the parade part, but I do suggest that you stick to a certain part of town if you want to do a bunch of tastings. Otherwise you end up blowing your budget on taxicabs (since you probably will decide the tube isn’t for you, eh?). La Latina is a great place to sample tapas, because there are so many restaurants, many of them with large terraces making easy to come and go and still find a seat – though the best places are always packed. You don’t need a tour guide. You can get a tour guide to talk you around to the various venues and bars, but do you really need one? Just grab one of the many mobile apps for Madrid, a Zagat guide, or ask around for the latest recommendations. Madrid’s foodie scene is very good and you’ll find it hard to go wrong, whether that’s a freshly uncorked Rioja or a piping hot tortilla.